Photo of John V. Baucom and Mary Griffin Baucom of Union Co., NC .click on photo for larger view. .
Picture of John V. Baucom and Mary Griffin Baucom of Union County, North Carolina made about 1908. Luther Baucom in center, twins, Lonnie Pernay Baucom and Flonnie Mae Baucom (Mrs. Jasper Simpson). 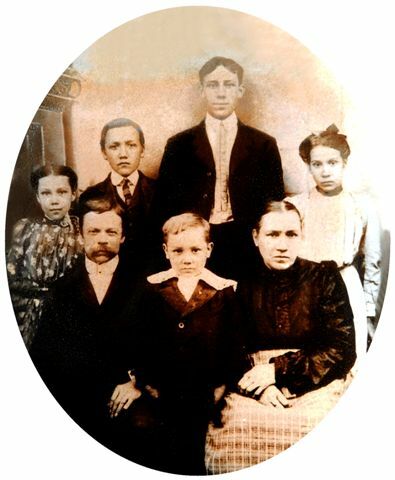 Hattie Louise Baucom on left, Vernon Baucom in center. John V. Baucom (Mar 2, 1855-Feb 15, 1928) was the son of Joseph Thomas Baucom (1825-1906) and Sarah W. Brantley Baucom (1826-1893). Mary E. Griffin Baucom (Nov 6, 1861-Jun 28, 1937) was the daughter of Joseph Griffin and Rebecca Green Griffin. John and Mary are buried at Union Grove Primitive Baptist Church Cemetery, Union Co., NC.